In hopes of spending a bit more time on getting Quirky Cookery going, Quirky Jessi is open to guest posts. If you have something quirky you'd like to post, just email me. I recently discovered wombats. By that I mean I didn’t discover them in my basement or anything, I just learnt of their existence. It might sound unbelievable that a 25 year old cannot at some point in their life come across a picture of wombat, but I think God must have been waiting until I reached an age where I could fully appreciate just how crazy these creatures are before he showed me one. Since seeing first image of these mad beings, I soon learnt that it is very difficult to find any image that makes them look vaguely normal. It leads me to wonder if their continued existence has been due in some part to the fact predictors haven’t got a clue what they are either. I mean, how would you even begin predicting what one of these gremlins would taste like? Duncan works for an online store selling white wardrobes and bedside tables. 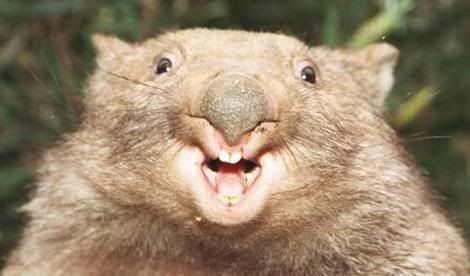 Wombats are awesome creatures. I have always wanted one as a pet. I didn't see any when I was in Australia, but did see a lot of wallabies. The local dingos have hunted these guys to near extinction, because they are so slow and easy to catch.